This pattern is available from interweave.com for $7.00. Gauge: 17 sts and 21 rows = 4” in Side Lace Panel relaxed; 13 sts and 17 sts = 4” in Side Lace Panel stretched for blocking (see Notes). I wondered about Elinor Ferrars (nee Dashwood) and how she’d mature in her marriage with Edward. I chose a lace pattern composed of a diaimond and leaf combination as I daydreamed about Elinor’s life in the parsonage; the diamond shape reminds me of window panes I have seen in buildings from that time period (Regency Era). A cable spine divides the back panel and runs around all edges of the wrap, enveloping the wearer in warmth and elegance with an essence of home. Elinor would likely have knit, spun, and sewn to keep her family clothed and warm. It is true that Delaford is the estate owned by Colonel Brandon (who married Elinor’s sister Marianne) in the novel “Sense and Sensibility”. However, Colonel Brandon gave the living (appointment of clergy) to Edward Ferrars when he thought that a circumstance of family politics was preventing Edward from marrying his love. In the end, Edward and Elinor were wed, and they lived in the parsonage at Delaford, meaning that Elinor would have lived in the neighborhood as well! This is a large piece, but knitted on size US8 needles with DK weight yarn, it knits up quickly. The blocking process is important, as it stretches the edges and helps create the scallops along the side panels. 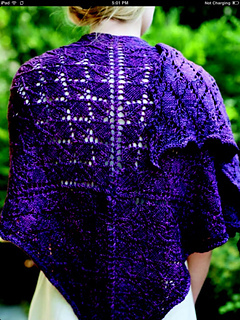 The construction is center out and adds an additional element of interest to the making of this shawl.